It’s summer. Long hazy days of sunshine. The smell of blooming flowers scents the air as cicadas screech their distinctive noises in an effort to beat the soaring heat. Children frolic mirthful in backyard swimming pools and cottage lakes, and lemon blueberry recipes swirl about the internet in droves. From cocktails to cobblers, scones to muffins, each marriage of lemon and blueberry promises to be a tantalizing culinary accompaniment to any summer activity. Today I have my own offering. A decided slant on the traditional lemon chiffon cake. 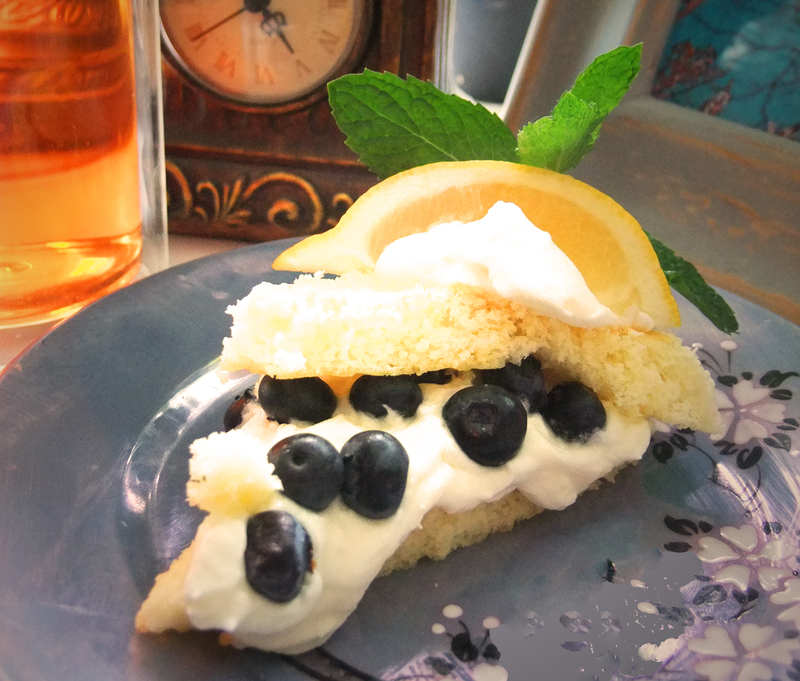 Infused with earl grey tea leaves and dressed up with sweetened cream and yes blueberries, I present the Earl of Lemon Blueberry. The original lemon chiffon recipe comes courtesy of a Christmas present I got from a tennis friend of mine in 1987. The worn cover depicts a decidedly 80’s version of Betty Crocker looking very much like a domesticated Princess Diana. And on the inside cover an inscription imploring me to ensure that I invited my benefactor to any tasting of the various recipes that lie within. Clearly even as a teenager my culinary talents were showing early promise. I know certainly my sweet tooth was. But over the years I gave Betty a makeover. Reinvented over the more than quarter century, I transformed this cake into my own showpiece. The rudiments though I still owe to Betty, wherever she may be. Betty’s cookbook I owe to Chris, wherever he may be. Beat egg whites and cream of tartar until stiff peaks form ~ 3 minutes. Mix flour, sugar, baking powder and salt. Beat in tea, oil, vanilla, lemon peel, and egg yolks until smooth ~ 1 minute. Gradually pour egg yolk mixture over beaten egg whites, folding with rubber spatula just until blended. Pour batter into a cookie sheet (10″ x 15″ x 1″ deep) that has been lined with parchment paper. And bake for 30 minutes. In a chilled bowl and with the chilled beaters, beat together the whipping cream and icing sugar to stiff peaks ~ 4 minutes. Cut cake into triangles, as you can tell from my picture, they don’t have to be perfect. Sometimes the rustic look is best. Top one triangle with sweetened cream and blueberries. Cover with a second triangle. And serve. That looks/sounds awesome. I really like the Early Gray. Have to give that a go sometime. Thanks! Thanks Ben! Lemme know how it goes for you. It’d be a well-deserved reward after the VT100 this weekend! ← Can I Carb Load Now?